Welcome to the perfect home base for your mountain getaway. 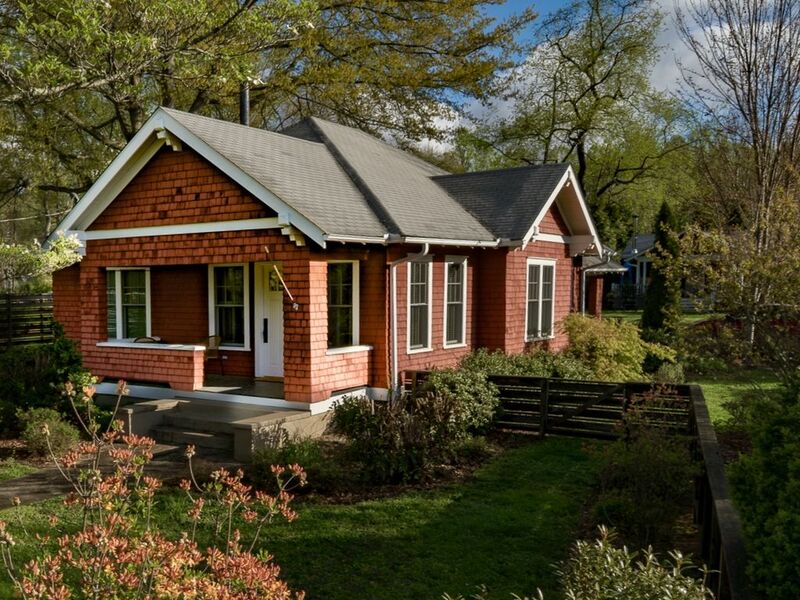 Our 1910 Craftsman Bungalow sleeps seven-plus in two bedrooms with four beds plus floor mattress and couch in the living room. Enjoy two full baths, fully equipped gourmet kitchen, dining room, living room with fireplace, front porch and rear patio seating, gas grill, fenced in yard and ample parking. It is a short walk to EVERYTHING BREVARD: great restaurants, unique shopping, local arts and music, and breweries, and an easy drive to waterfalls, hikes, biking, fishing, and more. Located in the LUMBERYARD ARTS DISTRICT (one of the oldest Brevard neighborhoods), this charming historic home was lovingly restored and updated in 2009 by Parker Platt a leading local architect. It features 10-ft ceilings, abundant light through large windows and doors, elegant trim and molding details and great maple floors. The master suite has a king bed, two walk-in closets, master bath with two sinks and luxurious shower. The second bedroom has a queen bed and twin over double bunk-bed and a lovely bathroom with dual shower. Extra sleeping on floor mattress and couch in the living room. FINE HOMEBUILDING magazine featured the restoration of the house in a 2012 edition. You will enjoy the home's beautiful paintings, pottery, prints, and art, most created by local artists. Here you will find all the comforts of home including a Bluetooth enabled sound system, smart TV, and fully equipped gourmet kitchen. Gareth and Steve’s home is located in Brevard, North Carolina, United States. Our home is in the Railway Avenue District, a quiet, family neighborhood in one of the oldest parts of Brevard (developed when the Transylvania Railroad came through in 1899). In the past decade, the nearby neighborhood has enjoyed the development of the Lumberyard Arts District, now home to several music and event venues, art galleries, Magpie Restaurant, Peaks and Creeks Brewing and Squatch Bikes & Brews. We are one block from the Brevard Bike Path Rails to Trails trailhead which leads to many more bike trails. We are one block from Brevard College and three blocks from downtown Brevard with its special collection of great restaurants, art galleries, unique shops and small-town charm. It is 1.5 miles to the Bracken Mountain Preserve and the Brevard Music Center. We are three miles from the magnificent trails in DuPont State Forest and an easy drive to many more outdoor adventures in places like Pisgah National Forest, The Cradle of Forestry Center and the Blue Ridge Parkway. And did we mention there are 250 waterfalls in our county?!? House is super charming and I really loved staying here! I would love nothing more than to give the red bungalow property a 5 star rating. If the rating was based on just the bones of the house and decor, it’s easy - 5 stars. However, there are spiders in the corners of most of the rooms, dog hair on the floor, door of the dishwasher and even when I opened the freezer drawer - yup - dog hair all in the bottom. I’m not sure what the professional cleaning service pays for but they need to change companies! Apart from that- I loved staying here. Tons of charm and close to everything we wanted to do. Note I still gave them 4 stars. A perfect mix of comfort and convenience. We would strongly recommend this bungalow to our families and friends. We would stay there again and hope to in the future. We'd give our stay more than 5 stars if it was possible. This was our second stay. We enjoyed everything about the home. Location is great, size is perfect for 4 to 6 guests, it's super clean and well appointed. This visit we enjoyed coming home and enjoying a fire in the fireplace after a day out on the trails. We'll be back for sure? A relaxing and comfortable hidden gem. It is hard to find a house this nice that allows pets. It made a difference in our trip that we could relax on the front porch while our dog played in the enclosed front yard. The quality of renovations on this home are excellent, as well as the artistic decor. It was comfortable, clean, and convenient. The owners are attentive and easy to work with. We hope to be back! We loved every minute we stayed at the Red Bungalow-we wish we could have stayed longer! Great layout, comfortable beds, lots of towels/linens, and well-stocked kitchen. We could walk 10 minutes to multiple restaurants and the downtown area. Hundreds of trails, waterfalls, hikes were within a 15 minute drive. This is a great way to see Brevard and the area. The Brevard and Transylvania County region is rich in opportunity to enjoy nature, culture, and entertainment.